Recreational and commercial drone sales are skyrocketing, as many affordable unmanned aerial vehicles (UAVs) have hit the market over the last couple of years. Owning and operating a UAV, however, comes with certain risks that could crush your personal finances or your business. Anyone who operates a drone knows the potential for pilot or mechanical errors. 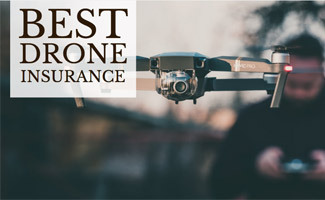 Drone insurance can save you from massive financial and legal woes if your drone gets damaged or stolen, and, more important, drone liability insurance can protect you financially if your UAV damages property or injures someone. Looking For A Personal Drone? All UAV owners must register with the FAA each drone weighing between 0.55lbs to 55lbs, regardless of its intended use. Commercial users must obtain a Part 107 license, also known as a Remote Pilot Airman Certificate (RPAC), with a small UAS rating. Hobbyist vs Commercial Drone Pilot? Wondering which category you fall into for legal purposes? Here’s a brief explanation to determine if you’re required to get a 107 license. Are Drones Covered By Homeowners Insurance? Your drone damages someone else’s property, home or car. Your drone causes bodily injury to someone else. Typically, homeowners insurance doesn’t cover damage to the drone itself or your property. Be sure to ask your insurance agent to make sure you’re protected. If you’re not covered by your homeowner’s policy, you should seriously consider getting personal drone insurance. Note: Since drones are relatively new, the laws and insurance coverages offered may change rapidly. Talk to your agent to get the specifics about your coverage in your state. Photography, real estate, tourism, insurance, law enforcement, agriculture — a variety of industries are using drones. If you’re using a drone for commercial use, you won’t be covered by your homeowner’s policy. You’re not legally required by federal or state laws to have commercial drone insurance, but the last thing you want is for your business to take a nosedive if significant damages occur from your drone. If you do a lot of contractual jobs, some clients may require you to have drone liability insurance as part of your contractual obligation. It’s also a good idea to check your drone local laws. Some municipalities may require you to have UAV insurance, especially if you’re flying a drone commercially in public areas. What Type Of Drone Insurance Is Available? Let’s say, you’re flying your drone in a public park, you lose control, and your drone crashes into a boy playing catch with his father. His injuries require surgery and other expensive medical procedures. Your financial obligations to cover his expenses could bankrupt your business — unless you have liability insurance. Although not required by federal law, UAV liability insurance is very similar to car liability insurance (which is legally required). Drone liability insurance protects you from third-party claims of injury or damage to cars, buildings and other property because your insurer assumes the financial obligations for paying such claims. Liability coverage varies by company. Some policies will even cover negligence on your part or invasion of privacy claims. Coverage may also vary based on the type of drone you operate, the reason for flying and your experience as a drone pilot. Make sure you read all the fine print of any policy to know what’s covered. After covering your liability, you may also want to consider hull insurance. This type of policy protects you or your business from accidental damage to the drone itself (and, in some cases, theft). If your drone crashes to the ground, for example, you’ll be covered for the repair costs or full replacement. Be aware, however, that hull insurance typically doesn’t cover damage to equipment, like a camera, that you have onboard your drone. If you need to insure expensive onboard equipment, you can extend your coverage by adding a payload extension endorsement. Liability makes up the bulk of your drone insurance premium. For example, a $1 million UAV liability policy would have an annual premium of roughly $500-$700. Insurance to cover physical damage to the drone depends on the drone’s cost. A $2,000 drone will run you an estimated 10% of the cost, resulting in a $200 physical damage premium. Higher-end drones ($10,000-$80,000), however, have much lower rates. Of course, these rates vary depending on the company and policy. If you’re just starting your drone research, be sure to check out our best personal drone reviews, which includes a variety of drones ranging in price from $30-$800. Do you use your drone personally or commercially? Is your drone covered by insurance? You should also check out bwifly. I got a quote from them and it was about $120 less expensive than anywhere else. I also tried Verifly but after I started getting a lot of business it was to difficult and time consuming, I would rather have an annual policy. Max, thanks for letting us know we’ll look into bwifly and consider adding them to our review during our next update. Thanks again!